Duminica a avut loc decernarea Globurilor de Aur, iar Bohemian Rhapsody, filmul biografic despre ascensiunea formatiei Queen a plecat cu doua trofee. 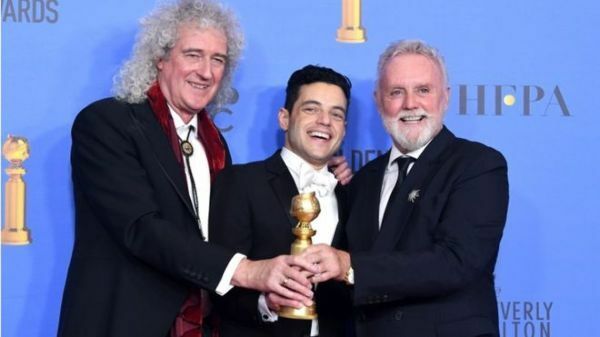 Rami Malek, actorul care il interpreta pe Freddie a primit premiul pentru cel mai bun actor iar filmul a primit trofeul pentru cea mai buna drama. Globurile de Aur sunt considerate ca o avanpremiera pentru Oscaruri, cel putin cand vine vorba de categoriile importante precum cel mai bun actor sau cel mai bun film. "My heart is pounding out of my chest. This is a profound honor to be counted among such extraordinary actors. I am privileged. Thank you to the Hollywood Foreign Press and to everyone who worked so tirelessly on this film. I have to thank Graham King and Denis O'Sullivan. You've worked over a decade to make sure this story was told. Thank you to 20th Century Fox. You believed in us."